Recently, the people who rescued me have been learning a lot about The Microsanctuary Movement, and have decided that they want to create the first fish microsanctuary. Soon my tank will be one of at least four tanks, all home to fishes experiencing freedom. My life was valued at $4.99. What was your life like before your rescue? For years, all I knew was solitary confinement. 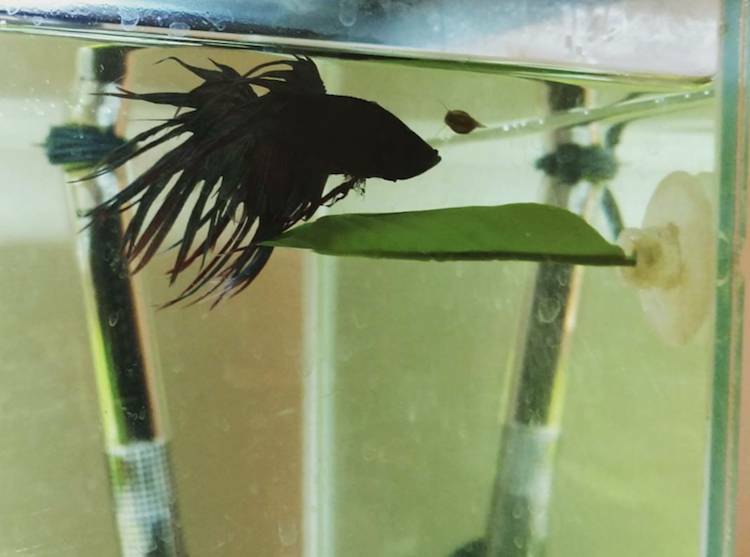 Humans have bred bettas to fight each other for sport, so I cannot share space with other males. Even though humans are the ones who did this to my species, we are the ones who suffer the consequences. My ancestors lived in Asian rice paddies, but I have lived most of my life in one small container or another. When I was shipped from the breeding facility to the pet store, my captors kept me in a tiny plastic bag containing barely enough water to keep me alive. I thought that nothing could be worse than that, but I was wrong. I was given a box to call my home. Two inches by two inches by two inches was all I ever got to see of the world. They brushed off my enslavement by half-assed references to our domestication, forgetting that they are the ones who made us suffer like this. My only interactions with other fishes were glances into adjoining boxes. Everyone I saw looked too depressed to move. Sometimes my neighbors died, and it would take the store owners days to notice because none of us swam around much in the first place. I wondered how my captors would feel if they were forced to stay right next to their dead and dying friends. One day, everything changed. Two humans came into the store and picked up my box. At first I thought they were just another pair of greedy customers, come to shake me around and then put me back on that lonely shelf. But they were gentle with me, and instead of taking me to be purchased like I’d seen everyone endure before, they took me right out of the store, right out of my hell. They put me in a larger box, and even though it was only about three times bigger than the previous one, it was the biggest place I’d ever lived. I was overjoyed to be out of the store, but I was also overwhelmed with my new surroundings and anticipation of what would come next. I was exhausted. 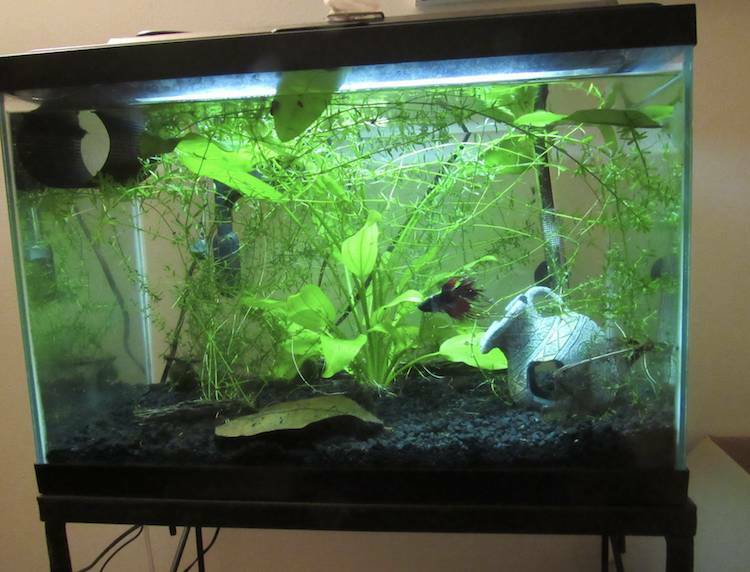 My new home, complete with real betta leaves and moss balls! 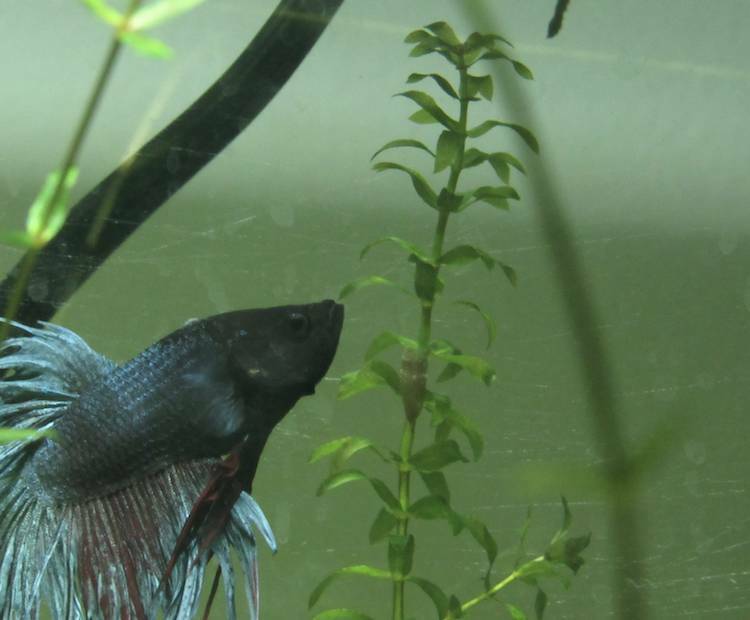 The day after my liberation, my new family put me in a twenty gallon tank. I didn’t know what to do with myself! I swam lap after lap after lap of the tank. The moment they put the heater in was the moment I was sure that these people really loved me--not because they could make money off of me, but because they just loved me as a person. 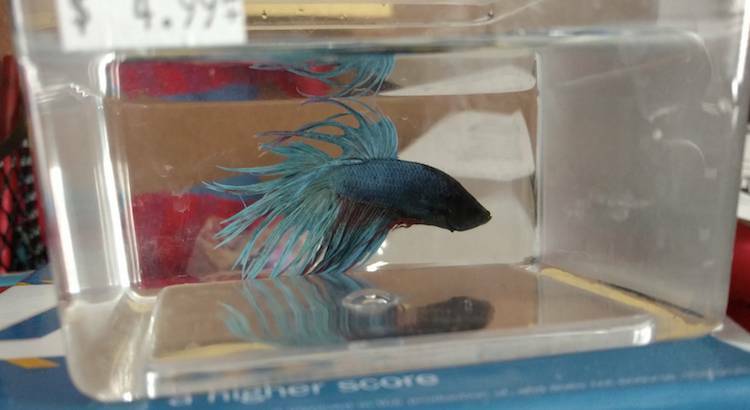 I had always been cold in the pet store, because we weren’t given heaters in our boxes--even though to keep bettas healthy we should be kept in 80 degree water. My new heater wasn’t the only amazing improvement though! My parents also installed a water pump, a filter, a light, gravel, some plants, a hammock, and a castle for me to hide in. I was rescued six months ago, and even though these have been the happiest months of my life, it hasn’t always been easy. I keep getting all sorts of illnesses, and the medicine available right now is adequate at best. My family is doing the best that they can, but they live in a world that would rather flush fishes down the toilet than spend any money on research for our diseases. I have been making friends! A few months ago, my dad ordered some live plants to add to my home, and there were snails on them! The snails have since reproduced and multiplied, so now I can never complain about being lonely! How has your companionship impacted your new family? Both of my parents had been outspoken about speciesism before my rescue, but I think living with me has made them especially passionate about addressing anti-fish speciesism. Humans don’t bond as easily with fishes as they do with mammals or even birds, and so most of the time our struggles are ignored, even within animal advocacy. Recently, my parents have been learning a lot about the microsanctuary movement, and have decided that they want to create the first fish microsanctuary. Soon my tank will be one of at least four tanks, all home to fishes experiencing freedom. Because nobody deserves to be kept in a box, and everyone deserves the taste of freedom.